How do you say, “too good to be true”? Or maybe I’m just plain lucky. Whatever the cause I still can’t believe my first review in the world of vinyl playback is that of the latest incarnation of my favorite cartridge from my youth. There is no other audio component that I ever thought was as revealing or as aggravating as the Decca cartridges of my twenties. I owned a blue, gray, and even a gold one; all with that bright red plastic part that allowed you to screw it into the headshell; and all with only three pins to connect to the four tonearm wires. I have owned as many as three at a time, hoping to always have one good working one on hand. So it is with great excitement and more than a little trepidation that I start to listen to the new Decca London Reference Phono Cartridge. The London Reference, previously known as the Decca Cartridge, has been in production longer than stereo has been around. As a stereo cartridge, it had it’s beginning in the seventies as the Decca Phono Cartridge. The physical appearance of the London Reference is first class for the first time. It is simple, but eloquent. Gone are the odd-shaped, odd two tone-colored Decca’s of the past, and thank goodness, also gone is the common ground: Now we have a normal, four-pin setup on the London which is easy to work with. Setup was surprisingly easy. The London Reference mounts like most all other cartridges and its wiring works with your existing wire. There is no longer any need for a Decca user to have to solder the two grounds together like in the past when the cartridge only had three pins. No, now all you have to do is connect the pins, pull out a good alignment gig, tighten the cartridge in, set the tracking force, adjust the VTA, set the anti-skating and enjoy the beautiful, and I do mean beautiful, music it can make. I was really concerned at how it would mate with the Clearaudio Satisfy Carbonfiber arm; but when dealer Warren Gregoire of WGA left from installing the London Reference, he pronounced it was sounding great. It surely was. As I mentioned in the introduction, the Decca’s were my favorite cartridges of my early audiophile years. I don’t want to spend too much time restating aspects from my “Beatnik’s Journey” column, but let me share a little of my personal history on this wonderful cartridge with our dear readers. Back in the 70’s, I had already fallen in love with the Decca London cartridges. 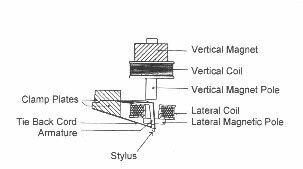 They were neither “moving coil” nor “moving magnet”, and they were the only cartridges I know of that had no cantilever, in the conventional sense. Other cartridges mount the stylus on the end of a thin, light, metal tube called a cantilever, and the short end of the cantilever attaches to either a coil of wire or a magnet. This creates what is known as “cantilever haze.” Once you hear vinyl without this haze, it’s hard to go back. The minute I heard the Decca I knew I had to have one. The Decca cartridges of my youth were amazing. They were immediate sounding, and had the deepest, tightest, and most powerful bass I have ever heard (or that’s the way I remember them). The only problem was they didn’t sound good for very long and no two Decca’s sounded exactly the same. I remember going to Dallas and listening to a dozen of the cartridges at Hillcrest Hifi and picking out the four best: two for me and two for Gene. Why did we buy two? Well it was quite simple; you needed one to listen to when the other one was on its way back to be retipped. You could extend the time before sending them back by removing the top plate and then using the smallest jeweler’s screwdriver you could find; you could tighten the tiny screws that controlled the tension on the thread that held the stylus in place. After a while, though, it just would not track and you had to send it back. To be honest, at their best, the Decca’s wouldn’t track the last track on most records unless you had a damped tonearm. Well, enough history. This isn’t a review of the Decca’s of my youth, but the very modern London Reference. So let’s cut to the chase; how does the London Reference hold up to my romantically enhanced memories of this cartridge’s predecessors? With most such memories, I am often disappointed when a chance comes along to revisit the past. How often have you gone back to somewhere and discovered it’s just not as special as you remembered? I so feared this would be the case for the Decca London reference, just another over-romanticized memory of my youth. Well, let me tell you this was definitely not so with the London Reference Phono Cartridge. The London Reference was everything I remembered and more. So let’s get started. What did it sound like? The first song I listened to with the new London was “Swing Low Sweet Chariot” on Joan Baez’s live album. From the first minute the now modern-shaped diamond stylus met the spinning grove, it was obvious this was something different from the excellent moving coils I had been listening to. There seemed to be more people in the crowd, more nuances in her voice, pulling you way into the music, and it was oh-so incredibly immediate and alive-sounding. It was clearer, more detailed, more transparent, faster, and much better at the frequency extremes than any cartridge I had ever heard. That was not all, though; most of all, it just sounded more like music. Don’t misunderstand that statement. No one would describe the Decca London Reference as a musical sounding cartridge (warm, sweet, liquid, and forgiving). Instead, it was a cartridge that allowed a good recording of the human voice sound like a human voice, a piano like a piano, and allowed whatever has been recorded on to that piece of vinyl sound more like the real thing. It also seemed to do something I hadn’t expected a phono cartridge to be capable of. It seemed to allow piano recordings to hold their pitch better, and string recordings also seemed to get the timing more like real strings. The midrange is where the heart of the music resides and a cartridge has to get this right. Like a really great SET amp, this was where the London Reference got “Scary Real”. The shear speed of the transients was just so realistic, while at the same time the timber of instruments seemed just so right. If other cartridges could remove veils between you and the music, the Decca literally opened up the window. There is very little one can say to prepare you for the midrange of the London. Voices excel with the London Reference. I have never heard better voices, male or female. They sounded pure, simple, and lifelike. It’s not that voices simply sounded more real; no they sounded more like the person singing. Take out a LP and listen to a recording of someone whose voice you are really familiar with. You will just sit back in disbelief at how much more it sounds like him or her than you ever imagined. Again I want to encouraged you to listen to some recordings where you know who the backup singers are and discover how much easier it is to recognize them with the London Reference in your system. This was not only the case with voices, but strings also came alive; and vibrant horns cut through with startling clarity; and I could keep going on, but you get the picture. The Decca London Reference Cartridge is capable of delivering the finest midrange imaginable. The midrange was better than I remember from the days of my youth. The bass is what I remembered most about the Decca cartridges. I owned these early Decca’s before I knew the descript terms of speed and slam; but with the Decca cartridges I experienced these for the first time outside of live music, and was shocked. The London Reference had bass that was just so natural. It had all the speed, weight, slam, and authority that I remembered. At the same time, it had a full, airy quality that real bass has. I remember years ago being in Birmingham at Jim Smith’s store. He was, at the time, an Audio Research and Mark Levinson dealer. He told me that he knew it wasn’t the conventional wisdom, but he preferred really good tube bass over the best solid-state bass. Me too. I am sharing this with you because the one thing I thought digital never got right was the air and resonance of bass instruments. I thought SACD came close, but when you hear a London Reference Cartridge, you will know what we have been missing most in listening to recorded music. You don’t have to settle for one or the other; you get both air and slam in the bass. As I said, one of my memories of the old Decca’s was their slam and speed in the bass. The new London Reference in no way let me down at this point, but I feel I should mention that some of the newest and best moving-coils are much improved in these same areas, and the difference in the quality of the bass may not be as great as it was in the 70s. Theoretically, because of their magnet designs, the Decca and London Reference cartridges should suffer a little by comparison with the best moving-coils and moving-magnets. However, in practice, I did not find this to the be the case. I think this is because soundstaging has more to do with low-level detail retrieval than it does with separation of the two channels. So it is not surprising that a cartridge that excels at detail and information also excels at special information. The Decca is exceptionally good at letting you hear acoustical information of the hall or venue. In my experience, this is another trait that leads to a believable soundstage. Joan Baez – I talked about above how incredible the Baez live album sounded. Her voice had all the nuances that make the human voice such an incredible musical instrument. You can hear her range, her breath, her phrasing with more ease than other cartridges. Ry Cooder, Jazz – This is one of those recordings that I had such fond memories of on vinyl, but never found a digital version of it that was very musically involving. Another recording I use in every review is Ella and Louis on the special edition Verve Japanese SACD. Personally I believe this is the best SACD ever. On cut 2, “Isn’t This a Lovely Day”, we hear Ella in all her glory and then Satchmo seems to be right in the room with you. I only have a used and not nearly mint copy of this on vinyl, and was shocked when the analogue setup clearly sounded more like music even than this great SACD. The London Reference just lets you hear more into it and lets the music just be more in your room. Evita – Another wonderful musical experience on vinyl that never quite worked on redbook CDs. On the opening of side four, there is a children’s choir. These delicate voices are reproduced so clearly, and with such beautiful harmonics through the London Reference. The phrasing of the singing actors is so precise that it comes across like they are just a few feet from you. Maybe most important of all is the way the emotion of side four comes through. As I listened, it was hard to think about how it sounded. I kept being drawn into the sadness that Evita was dying. It is the performance, not the sound, that the Decca allowed you to focus on. My other memory of the Decca cartridges was centered on how frustrating they were. In my recent “Beatnik’s Journey”, I wrote about the Decca’s of my youth: “The only problem was they didn’t sound good for very long and no two sounded exactly the same. I remember going to Dallas … “ Well, for the most part, all of these frustrations have been alleviated; although in the end, it’s still a Decca. Yes, this was the best Decca ever and capable of moving the state of the art forward in music reproduction in the home; but still a Decca. I will share some areas of concern with you but, in the end, it will be your decision if you can put up with a couple of quirks to own what is probably the best phono cartridge in the world. Quirk 1: You will need very clean records, to be played by a very clean stylus, and you must keep both of them very clean. The London Reference, like the previous Decca cartridges, just wants to plow through the dirty groves. What it will do, though, is gather the dirt onto the stylus and with time, for some reason, it gets more and more difficult to get it off – but you can – and I think it’s surely worth the effort. When the London is even slightly dirty, or when the VTA is too high, it sounds threadbare. Quirk 2: It’s not very tolerant of less than well-kept records. Now, if your comparison is to an older Decca, the London Reference will seem to be good at this. But after being compared to two different moving-coils and one new moving-magnet, the London just isn’t as tolerant of warn and dirty records as they were. Now to that statement it’s still a Decca, It seems that there is something inherent in the design that makes it sound like mistracking when either of these quirks are not taken care of. If we were talking about an amp, preamp, or speakers, we would just say that you must be careful to match it with gear that is up to its level of performance to hear all of it’s glory. The difference here is that we are talking about matching it to your source. I think most people who could afford the London Reference Cartridge could afford a two-tonearm setup: One with the London Reference and one with a cartridge of their choice that is more forgiving of their less well cared for vinyl. I have found the Benz Micro L an excellent choice for this purpose. If you can put up with and take care of these two quirks, the London Reference Phono Cartridge is indeed exactly that: a reference cartridge, one that sets a reference for transparency, immediacy, and music is-in-your-room experience. I am considering the purchase of the London Decca Reference cartridge and read with interest your review. At least two other reviewers, while waxing lyrical about particular characteristics could not get over what, for them, was an intractable problem with tracking certain recordings. Your experience appears to be different. I am in something of a quandary. While I love my current stereo cartridge (Shilabe) there is something enticing about the qualities associated with the Decca Reference. I would be grateful for any additional information you would be willing to share. I am using a modified Garrard 401 with a quite massive dual stage four inch slate plinth that weights over 130 pounds. I would probably use my Schick 12 inch tonearm with this cartridge. Not being able to audition the Reference puts me at something of a disadvantage and it is a little too expensive to purchase one and then find out it later it will not perform properly. To that point, I am in a position to hear the less expensive Decca Super Gold in my system but that cartridge is quite a bit further down the product chain and I am not certain what I will learn by hearing it. Thanks again for any council you may be able to offer. It’s not going to win any awards for tacking but the Reference is a pretty good tracker. The best I have heard it sound is in a Dynavector tonearm. I would think it would work great in a Schroder, but do not know for sure. Do you live any where near the SF Bay area, there is someone there that could help you with an audition. Thanks for the additional color Jack. Appreciate the audition connection but I live in New Jersey. I will set up the less expensive Gold model and see what I learn. Hello, I have read with great excitement your review of the London, I have managed to source a second hand one with unser 200 hours on it, I was not going to bother as I thought my clearaudio satisfy would not cope. But it sounds to me that it will. Can you give me any good tips on the set up for this arm and equipment I can use. Also was the bar type headshell of the satisfy turned to 90 degrees to the arm wand. I see in the instructions that the headshell is not offset. Like you, I started using Decca Cartridges in another lifetime (I think a half century qualifies). I still have 3 of them. I also still have my Transcriptors arm. Back then, it (or the A+D) was believed to be required. How about now? Can tracking still be improved with the fluid damping? Thanks.